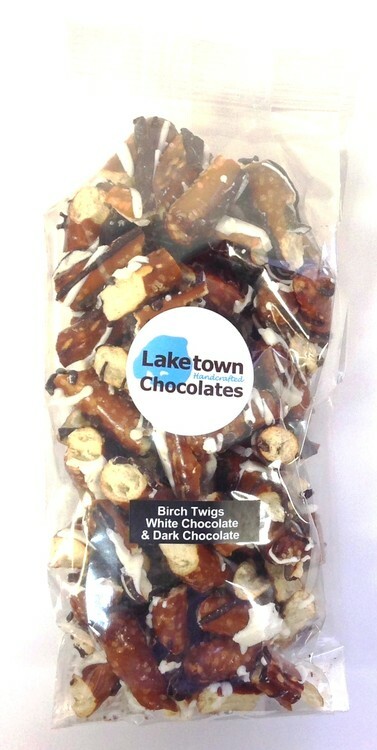 6.0 oz clear cello bag filled with Birch Twigs: white chocolate candy dipped small pretzel pieces drizzled with dark chocolate. Made to order fresh in our confectionary kitchen. Bag is heat sealed to ensure freshness. Makes a great food gift or Up North Minnesota themed promotional giveaway. Includes up to 4 color process imprinted label attached to the front of the clear bag. Also available in milk chocolate and caramel versions.